Drivers round the Infineon Raceway in the 2009 Toyota/Save Mart 350. 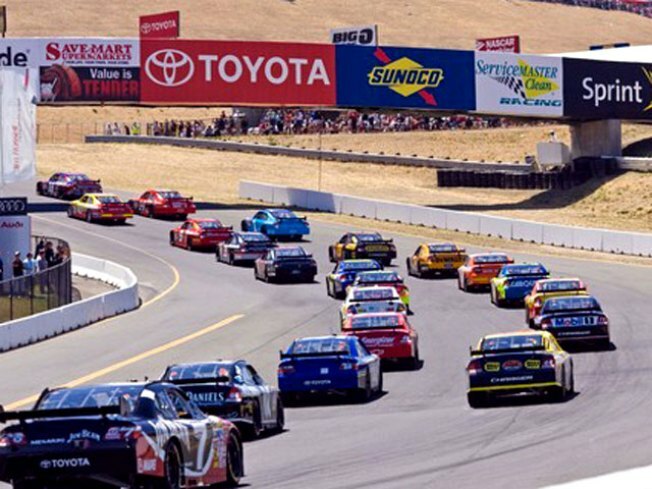 The heat is on this weekend in Sonoma Valley as the Infineon Raceway hosts the Toyota/Save Mart 350 NASCAR Sprint Cup Series. Drivers started burning the rubber at the Sears Point track Friday as they took to the raceway for the qualifying and practice rounds. It's a double-header weekend. The Thunder Valley Casino Resort 200 NASCAR West Series takes center stage on Saturday at 12:30 p.m. leading up to the main event Sunday. Gates open Saturday just before 9 a.m. for race fans who want to watch the drivers in the final practice laps of the 64-lap course. The Legends Race starts at 3 p.m.
Race day Sunday starts with plenty of activities for everyone. Fans of fast cars can take in an aerial eye-feast at 10:30 a.m. for the Patriots Jet Demonstration Team from Airshows America. Military jets will also be zooming overhead. The engines start revving for the main 100-lap race at noon. But there's a lot more going on for fans than just fast cars. Games, activities and auctions will provide much entertainment and fans who want to really get a feel for the race will have a chance to walk the track Sunday morning. Eyes to the ground for the walkaround -- specially-pained lugnuts planted along the track will be redeemable for prizes. Jeff Gordon, Dale Earnhardt Jr., Jimmie Johnson, Tony Stewart, Kyle Busch and defending race champ Kasey Kahne, aren't the only big names to look out for at the Wine Country track. Legendary San Francisco 49erRoger Craig is the Grand Marshall of the weekend. Even though he has three Super Bowl rings, he's a little star-struck. "I can’t wait to see all the drivers, like Jeff Gordon and Jimmie Johnson. I hear Jeff is a 49ers fan," Craig said. "Football was pretty incredible but I’m thinking this might rank right up there as one of the coolest things I've done."